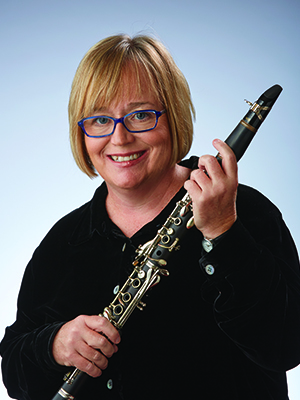 Cathryn Gross was born in El Paso, Texas and began the study of the clarinet at age 8. She earned a B.M. degree from the Eastman School of Music and an M.M. from the Indiana University School of Music. Her major teachers have included Eli Eban, James Campbell, Charles Neidich and Alfred Prinz. Before joining the Indianapolis Symphony Orchestra as interim second clarinet at the beginning of the 2002-03 season, she played acting principal clarinet for one season with the Louisville Orchestra, principal clarinet with the Augusta (GA) Symphony and second clarinet with the Indianapolis Chamber Orchestra for four seasons. She won second prize in the International Clarinet Association Young Artists Competition in 1990. Away from music, “Trina” enjoys knitting.